Bat Conservation Ireland is a Charity dedicated to the conservation of Ireland’s bats. They promote conservation of bats by disseminating educational materials, giving talks and leading bat walks, carrying out nationwide surveys and monitoring of bats, acting as an umbrella group for the local bat groups and providing a central repository for bat records. Regular monitoring is the key to picking up any declining (or increasing) trends in bat populations, which are in turn, important in forming conservation policy and management on a nationwide and EU level. • Car monitoring: Bat Conservation Ireland, in partnership with The Bat Conservation Trust (of the UK), has been administering a car-based monitoring scheme since 2004. For presentation pdfs click here. 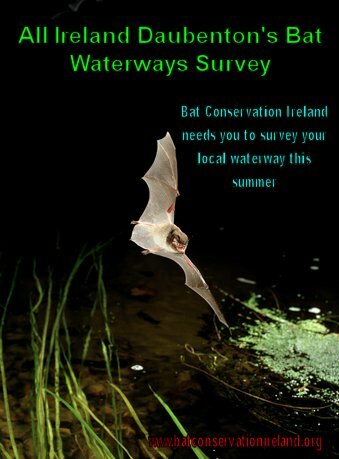 • Conservation: Bat Conservation Ireland carry out specific bat education, monitoring or other bat conservation work. Reports, factsheets and guidelines for specific industries or for dealing with bat-related issues can be found here.